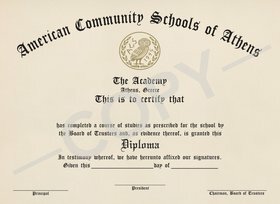 The MSA-CESS accredited program of ACS Athens requires that a student must fulfill the academic requirements of an American Diploma curriculum in order to complete his/her studies at the school. Four English credits. Classes are taken each semester in grades 9-12. The following courses or their equivalents must be taken. English 11: Humanities or a year of IB English Literature or IB English Language and Literature year 1. English 12: Humanities, or a year of IB English Literature or IB English Language and Literature year 2. Three years of Mathematics including Geometry with Algebraic Topics (It is recommended that students take four years.). One semester of Health, preferably in grade 10. Two semesters of Computer Technology. Plus two full years of Social Studies classes in grades 11-12. Two semesters of Visual and Performing Arts. Students may elect courses from the Visual Arts and Performing Arts. Three semesters of Physical Education. All 9th graders must take Physical Education. A third semester must be taken for graduation, preferably in Grade 10. The remainder of the credits is to be earned through the various elective courses offered in grades 11-12. * Course Selection: Students must elect eight courses per semester, including Academic Advisory in grades 9 and 10 and then Junior and Senior Advisory. Students in grade 11 who are not enrolled in the IB Diploma Program or five IB certificates or AP courses must enroll in eight classes including Junior Advisory. The same students in grade 12 not enrolled in the IB Diploma program or five IB certificate or AP courses must enroll in eight classes including Senior Advisory and Study Hall. Exception to this in extraordinary circumstances must meet with the principal’s approval. A Theory of Knowledge class, which unites the various areas of studies and deals with the ways humans perceive the world. This course provides an opportunity for serious reflection about all of an individual’s studies. Students are required to write a 1600 word essay during their senior year. A 4,000 word Extended Essay (EE) based on original research and chosen by the candidate from one of the six subject groups. The Creativity, Activity and Service (CAS) requirement met through student engagement in various co-curricular activities which involve artistic expression, creative projects, physical activity, and community service. Theory of Knowledge can be taken as an IB course by any grade 11 student. In May of each year, students, after having completed their two year program, sit for externally assessed examinations which, are graded on a 1-7 scale: 7 being the highest mark awarded. Students also complete a number of internally and externally assessed or moderated projects, papers, presentations and/or performances in each course. These assessments constitute a percentage of the final IB score in each course. Students will sit for mock exams in IB courses during the final exam periods in grade 11 and the midterm exam period in grade 12. There is no “N” (non-submission of work) awarded for Theory on Knowledge, the Extended Essay or for a contributing subject. The Advanced Placement® (AP) program has been run by The College Board, a non-profit organization, since 1955. It offers a wide variety of rigorous, analytical and challenging college preparatory courses. Depending on performance, candidates can earn worldwide university credit. The design, delivery and assessment in these courses offer a unique learning experience as it enables students to gain deep understanding of the subject, to develop advanced skills in writing and problem solving and to become actively involved in the teaching process. Courses run for one year, at the end of which students take external, standardized tests provided by The College Board and administered by the licensed school. The duration of the AP courses, compared to those of the IB, allows the students to design their own unique program that best fits their student profile and academic plans. In many instances, such programs have been proven to be more effective and timely for a great number of students. Students receive a certificate for each AP course they complete. For each AP exam the student takes, AP courses can help students acquire skills and habits necessary for success in college. The rigor and advanced level of these courses make the AP program widely accepted by universities and colleges around the world. All AP courses are honors level and are designated on the transcript as such. 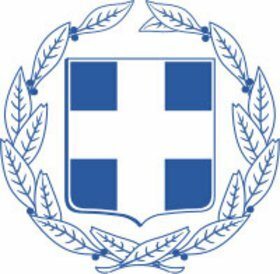 ACS Athens students entering 11th grade (IB1) have the option to apply for the 2-year Greek High School Equivalency course (Απολυτήριο). These students - who must be Greek language native speakers - attend the Greek Language, Literature and History course and must pass the course exams in order to be eligible for the Greek Diploma.